This paper provides an overview of on-going development and validation of a non-linear time domain panel method for high speed craft operating in waves. 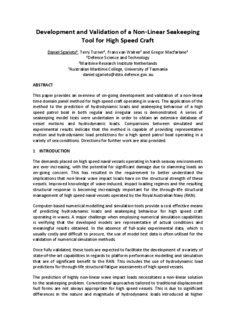 The application of the method to the prediction of hydrodynamic loads and seakeeping behaviour of a high speed patrol boat in both regular and irregular seas is demonstrated. A series of seakeeping model tests were undertaken in order to obtain an extensive database of vessel motions and hydrodynamic loads. Comparisons between simulated and experimental results indicate that the method is capable of providing representative motion and hydrodynamic load predictions for a high speed patrol boat operating in a variety of sea conditions. Directions for further work are also provided.